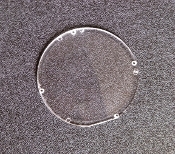 Clear plastic instrument lens for dash cluster. Each dash needs 2-3 lenses. For 1970-77 AMC Hornet / Gremlin models. Price is for 1 lens.